What a difference a day ( and some deep breaths) makes. The last few days have been a bit of a struggle to keep our little ship afloat. Noah seems to be determined to get a reaction from me (by ANY means) and it has been pretty bloody exhausting to balance on the knife edge. If you have a very free spirited 3 year old, I’m sure you understand what I mean! Yesterday I realised that maybe actually he does need me a little bit more than I thought. I spoke to a lovely helpful member of the children’s centre on Monday and she reminded me of all the things I already know, but I need to hear. 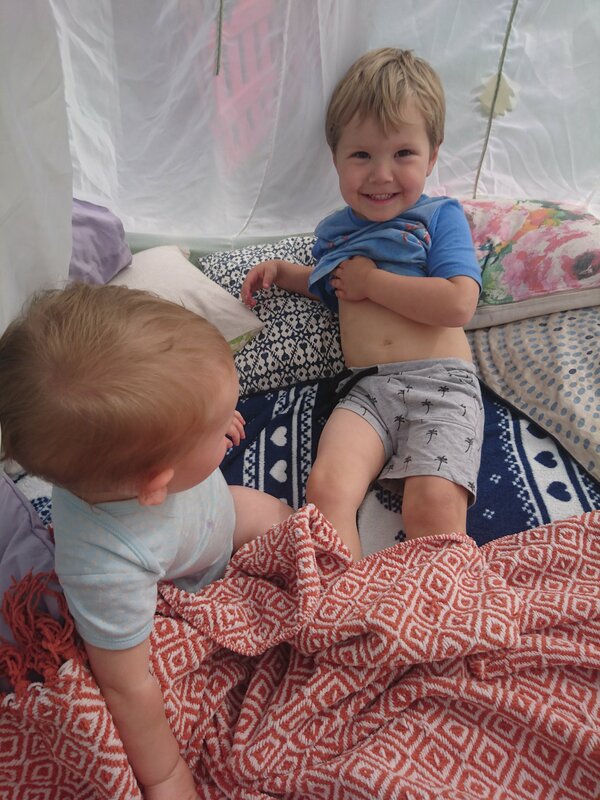 So I let myself stop worrying about the washing that doesn’t end and played on his trampoline with him and Oswin. He was so surprised and happy to have me there that he kept kissing me and saying I’m the best jumper ever. What more could you hope for? Today I woke up ready to be the positive and gentle parent I want to be. I don’t want to be the mum who says no just out of habit and to hurry him because I think he’s taking too long. Today I tried again and will no doubt loose my temper and have to try again another day. The thing is, today, I had an observer. I had my family friend’s daughter with me, she is 11 but wise beyond her years and a fantastic help with little ones. Today she said to me, after a whole day of seeing how I talk to my kids and how I deal with their demands and tantrums, “you are such a happy person, you’re like sunshine”. She said I don’t let noah get to me and I don’t get tough when they don’t listen to me and I’m not at all like her mum. To begin with I did the are you mad? Laugh. I had no idea why she thought I was so happy when I feel like I am in my own little anxiety filled storm cloud most days. But then I looked back through the many points in my day where I have had to battle with Noah, break up fights in soft play and deal with winnie constantly trying to undress me whist shouting “boobies, Yeh, boobies?” in public. I realised that actually I was pretty calm, we dealt with each issue without shouting or threats. We made races out of getting in the car or putting shoes on and had the ‘one more play’ before we left the playground. Noah didn’t fight me, I spoke to him like a very clever child, not a naughty toddler and he responded brilliantly. I’m not saying this always works but God it’s nice to be told I’m doing OK. Even if it is by an 11 year old! I’m goin to do my best to ignore the behaviour I know only appears when he is tired or wants my attention and flood him with praise and attention as much as I can from now on. It’s hard work but jesus, arguing with a 3 year old takes years off your life I’m sure! They do not back down. We have walked in the common, made a bed outside and have eaten quite a lot of popcorn. They were both asleep by 8 without a battle and I don’t feel like crying. Let’s see what we can get up to tomorrow!